Looks like sea pickles are here to stay. 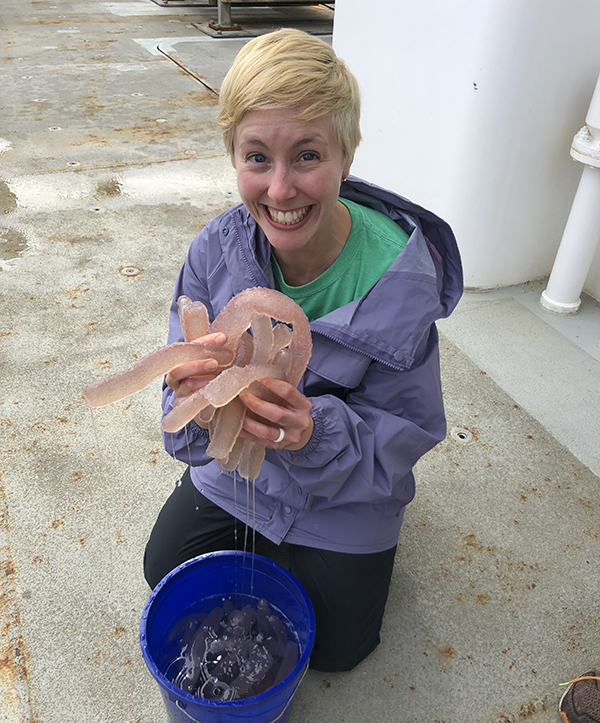 New research led by UO marine biologist Kelly Sutherland and her graduate student Hilarie Sorensen makes that conclusion about the tubular colonial jellies, known as pyrosomes, in a paper detailing their range expansion in the journal Ecology. 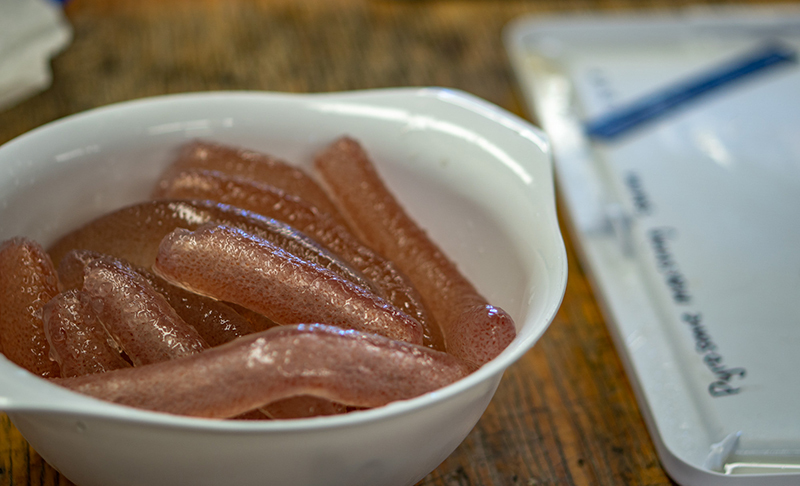 The jellies arrived in 2014 along the Pacific Northwest Coast and appear to be adapting to cooler water. Their presence, the five-member research team noted, could mean a continued nuisance for regional fishing operations and changes to energy flows that could alter long-existing, near-shore food webs. “These animals may be able to survive in colder water than we previously thought possible, but what might really be contributing to their continued presence is that the food source off of our coast is right for them,” Sutherland said. 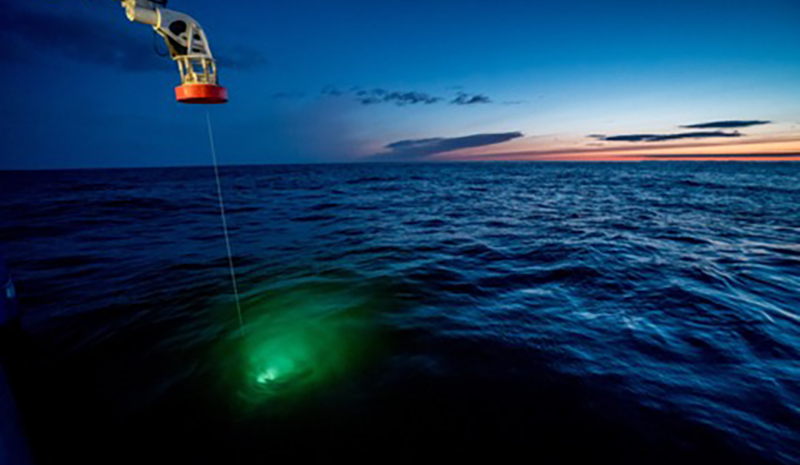 Sorensen helped document the sea pickle invasion during a research cruise in 2017. That prompted a deeper exploration about what was going on. The nutrient-poor conditions, Sorensen said, lead to smaller prey particles that pyrosomes can capitalize on. “What we are seeing could be systemic of larger changes in the ecosystem,” she said. 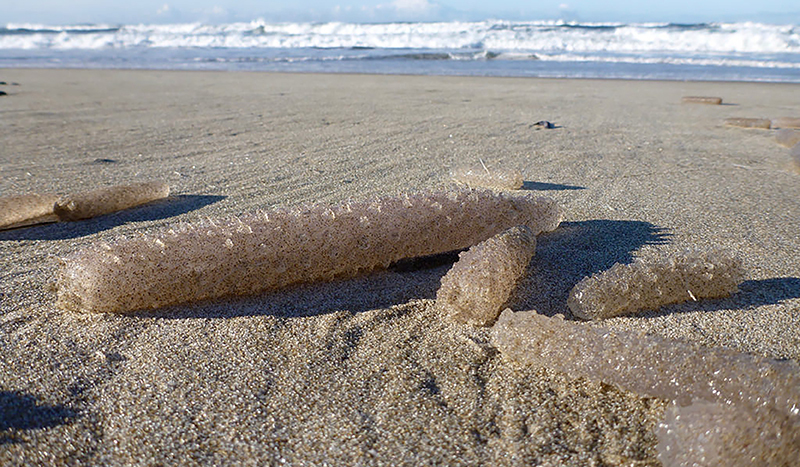 Pyrosomes are individual small, multicellular organisms, linked into a tunic to form a colony shaped like a tube. They are filter feeders that use cilia — tiny, hairlike projections — to draw plankton into their mucous filters. The ones seen off Oregon in 2017 ranged in size from about an inch to more than 2 feet long. 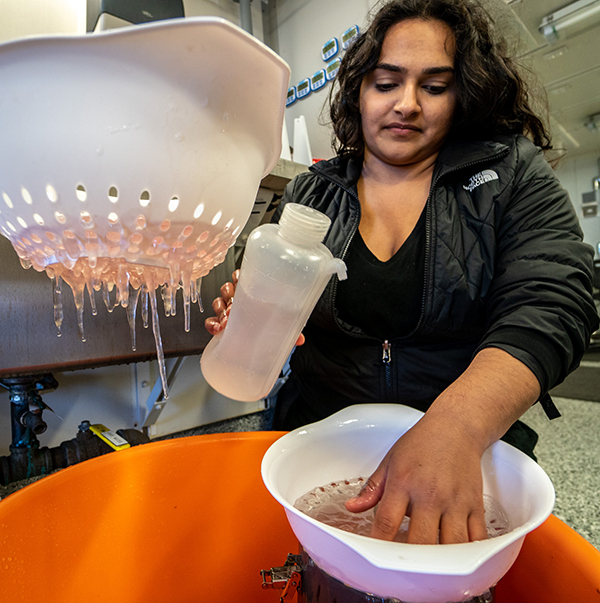 Researchers in Sutherland’s lab have been involved in recent efforts to understand filter feeders. Aaron Galloway was a third UO scientist on the research team. Sutherland, Sorensen and Galloway are all with the Oregon Institute of Marine Biology at Charleston. Until 2014, the creatures were common in warmer waters south of California’s Cape Mendocino. They possibly then began moving up the coast into the Pacific Northwest as part of a multiyear “warm blob” that was followed by a strong El Nino in 2016, the researchers noted. 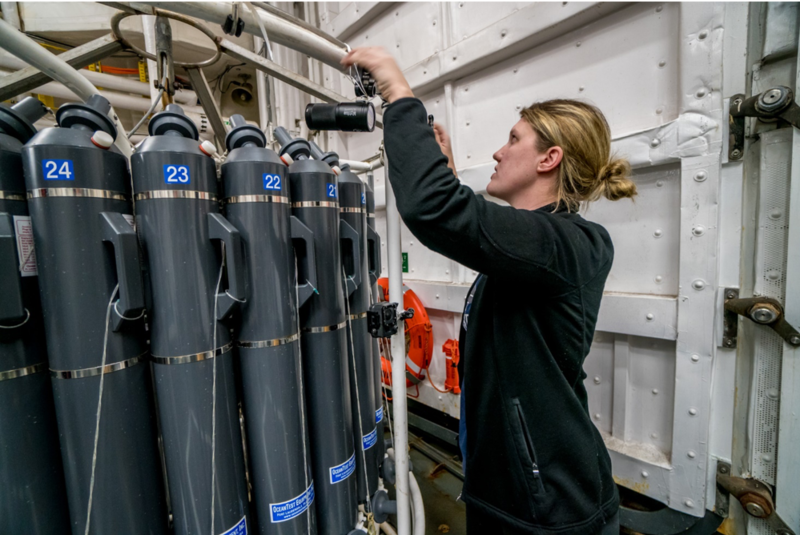 During a research cruise in February, pyrosomes were found amassed in large numbers at three separate locations, six, 15 and 28 miles offshore from Newport, where the water temperature was about 50 degrees Fahrenheit. The jellies were found at the base of the surface layer at a depth of about 130 feet. 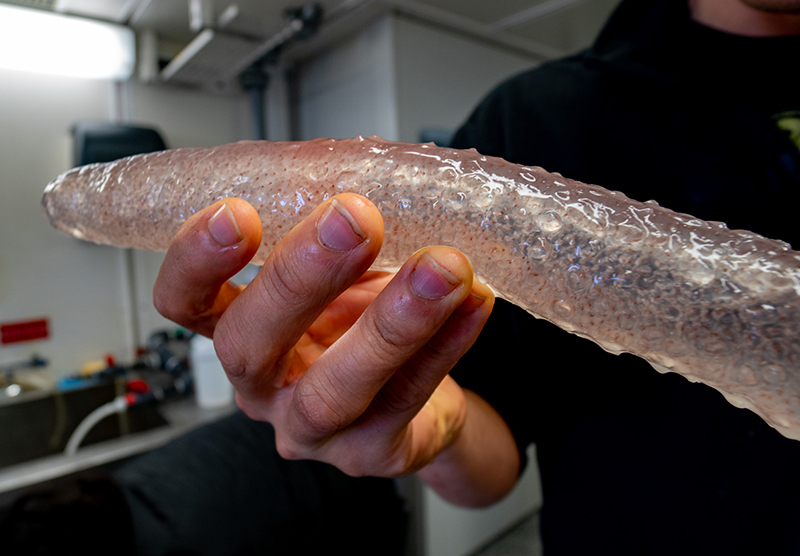 Their continuing presence and their capacity to reach bloom proportions, the researchers wrote, suggests that pyrosomes may be thriving in colder waters and could become more permanent residents in the California current, which extends from near Baja, California, to southern British Columbia. Other co-authors on the study were Olivia Blondheim of Drew University in Madison, New Jersey, and Richard Brodeur of the National Oceanic and Atmospheric Administration's Northwest Fisheries Science Center at Oregon State University. 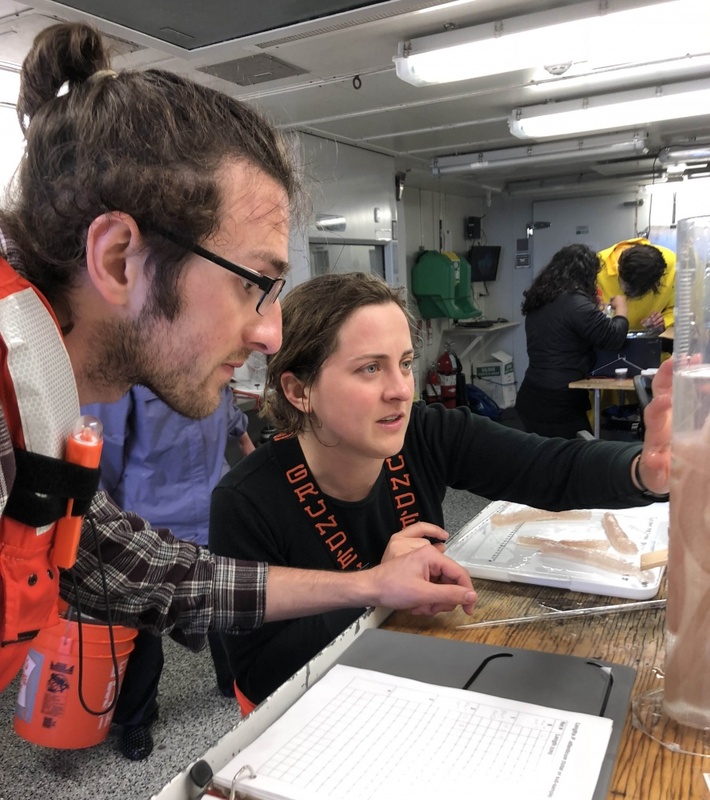 Sutherland’s research group gathered pyrosomes during two research cruises this year – in February and July – as part of a National Science Foundation-funded project with Oregon State University to study zooplankton in the northern California Current that runs along the West Coast. 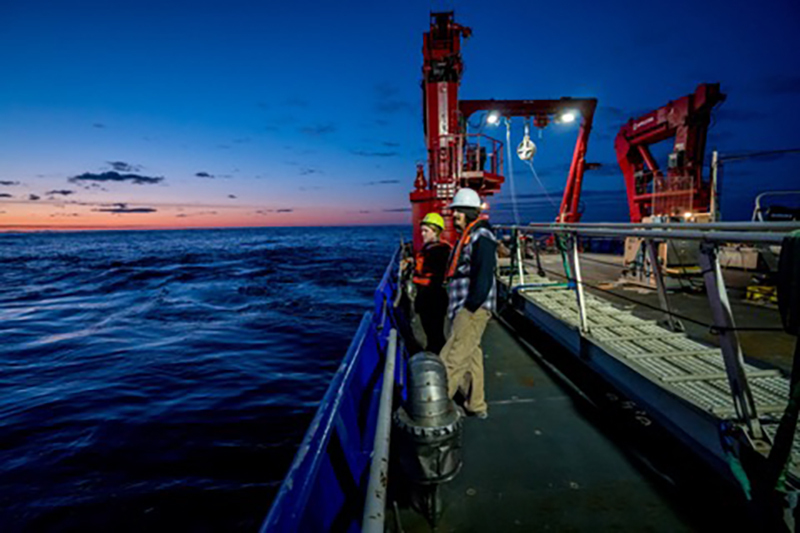 OSU’s team is led by Bob Cowen, director of the Hatfield Marine Science Center, and Su Sponaugle, a professor in the Department of Integrative Biology. In addition to the National Science Foundation, Oregon Sea Grant and the Northwest Fisheries Science Center funded the work covered in the study.